Colt Armory DomeAs I drove down an unfamiliar street in Connecticut’s capital city, I wondered whether a self-guided tour of Hartford’s 19th-century “places of invention” was practical. It seemed so easy when I looked at a map and plotted out addresses I gathered from my colleague Eric Hintz, the Lemelson Center historian now researching the inventive history of Hartford for our Places of Invention exhibition. I even consulted an interesting book, In and About Hartford: Tours and Tales, which provided helpful maps, sketches, and descriptions of historical sites within the modern city. Fortunately, since our exhibition focus is on mid-to-late 19th-century Hartford, which was much smaller than the city today, the factories, houses, parks, and other community locations I sought were in fairly close proximity. I traveled to Hartford specifically to give a presentation at a museum conference, but wanted to maximize my visit by photographically documenting some local historic sites we have been studying for the exhibition project. Among other things, it was an opportunity to experiment with an idea we’ve discussed about creating mobile app tours of historic, invention-related sites in cities today, based on contemporary and historic photos, sketches, narrative descriptions, and other primary and secondary resources. Obviously, many buildings have been altered or replaced between, say, 1861 and 2011, and the surrounding landscape has changed significantly. However, I was pleasantly surprised to see how much remained recognizable from the 19th century. I focused primarily on places associated with inventor Samuel Colt (1814-1862), best known for his single-barrel, revolving-cylinder revolver. During the Mexican American War of 1846-1848, the Colt revolver gained fame and soon became popular not only in the United States, but also abroad-the Russian Czar Alexander II was one of Colt’s best customers! The original Colt Armory was built in 1855, but was destroyed by fire and rebuilt shortly after Colt’s death. I took photographs of the existing Colt complex, which is located in the now-designated National Historic District of Coltsville and is undergoing large-scale adaptive reuse. One remarkable architectural element is the Armory’s onion dome (a replica) that is painted blue with gold stars topped with a gold orb and, appropriately, a “rampant” colt on its hind legs-the Armory’s trademark. There are several theories about why Samuel Colt chose an Eastern-style dome: a tribute to the Russians or Turks who purchased his guns? Just a marketing ploy? Regardless, the striking landmark, which can be viewed from highway I-91, continues to attract attention to the area, and Connecticut legislators are actively lobbying to get Coltsville designated as a National Park. Other important remnants of Coltsville are less obvious to the casual observer. I was thrilled to photograph a row of the original Potsdam Village houses that Colt built for craftsmen recruited from Germany to help them feel more at home in Hartford. They certainly pale in comparison to Colt’s nearby Italianate mansion, Armsmear, built in 1857, which was converted into retirement housing in the 20th century. 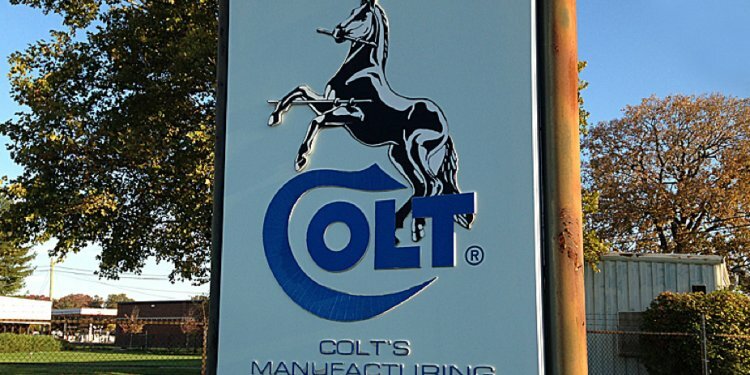 Right next door is Colt Park with a very grandiose memorial to the famous inventor, courtesy of his beloved wife, Elizabeth, who helped manage Colt’s Patent Fire Arms Manufacturing Company after Samuel’s death at age 47. Elizabeth was determined to ensure his legacy by having civic monuments like this one erected around the city of Hartford. Other sites I photographed included a series of the factory buildings along the 400-500 blocks of Capitol Avenue. Now home to Connecticut state government offices, this area was a major industrial hub during Hartford’s 19th-century heyday when Colt, Pope, Weed, Pratt and Whitney, Hartford Machine Screw, and other factories were producing guns, sewing machines, bicycles, typewriters, and more. As it happened, I parked on a side street lined with beautiful Queen Anne-style row houses built in the 1880s for employees of these former Capitol Avenue factories.